Moving day is right around the corner, and you can’t wait to bid farewell to your overstuffed abode for a brand new place. But wait! There’s a lot of work do. It’s time to get packing and finding a place to store all of the items cluttering your home. Packing for a move isn’t always the most enjoyable experience, but we’ve got some tips to help you keep the process stress-free. The time to purge unwanted and unneeded items is not after the big move, it’s before. Take the time to rid yourself (and your home) of excess junk. Pack up those old toys, books and knick-knacks and send them off to a new home. Next, pack up items that you won’t need for a while. Seasonal clothes and decorations should be packed in boxes that can go in the back of your Zippy Shell storage unit. Pack up extra towels, sheets, blankets, pots, pans and food storage containers. Keep out only what you will need during the transition. Packing up your entire home is exhausting, but you don’t want to sacrifice your best china because you tried to get through it quickly. Be sure to do it right by utilizing the right packing and storage supplies. Your Zippy Shell specialist can advise you on the best wrapping and packing materials for your items, especially for packing larger items and extra fragile pieces. We suggest you keep a supply of old towels, sheets and blankets handy for protection padding of furniture in the Shell during transit. This saves on the cost of renting protection blankets. There is nothing worse than getting to your new home only to discover that you cannot find an important item. The best trick to a stress-free move is labeling every box clearly. 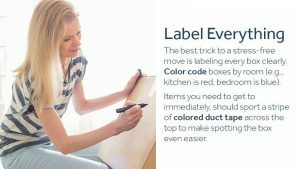 Color code boxes by room (e.g., kitchen is red, bedroom is blue). Then tape a list to the outside of each box that clearly describes what is inside. Items you need to get to immediately (like your child’s favorite blanket), should sport a stripe of colored duct tape across the top to make spotting the box even easier. Again, you can color code these stripes by room or individual family member. Gather household goods in a central location to speed up the loading process. This ensures cost and loading efficiency, as well as making it easier to create snug loads that don’t move during transit. The less space left between items during transit, the more protected your goods will be. Zippy Shell doesn’t just offer moving services, we store things too. Our long term storage services allow our customers to pack and store some of their belongings in a safe, climate controlled environment long after move-in day. By not having to deal with hundreds of boxes, unpacking becomes less of a chore and more of a joy as you acclimate to your new home. Days, weeks or months later when you have the time, all you have to do is call Zippy Shell and have your additional items brought to your home for unloading and unpacking at your convenience. Zippy Shell prides itself on our superior customer service. Have a moving or storage question? Pick up the phone and give us a call. Our knowledgeable staff can give you the help you need to make your move as simple as possible. Whether you need to clean out a few rooms of your house or you need to move everything to a new location, Zippy Shell makes the moving and storage of your treasures as simple as possible. We bring our 8 or 15 foot storage shell right to your location (even in the middle of the city), and let you pack it at your convenience. When you’re ready, we come pick it up and either take it to our storage facility or to your new home. Zippy Shell is not your average moving and storage company. We are excited to be in the Columbus area and look forward to helping you make your move as easy and smooth as possible.